A seemingly boundless stretch of beautiful beach overlooking the Caribbean Sea is the backdrop for your elegant and fun-filled all-inclusive vacation. At Moon Palace Grand the property offers guests everything they need to enjoy an all-inclusive vacation. Five-star, luxurious accommodations, extraordinary dining options, top-shelf liquors, 24-hour room service, indulgent spas, complimentary Wi-Fi and unlimited local and long distance calls to the continental U.S. and Canada, as well as nightly and world class entertainment. The property also has 10 restaurants and 6 Bars to accomodate any of the guest needs. When you book a vacation at Palace Resorts, you’ll automatically get a credit in your guest folio — up to $2,500 US Dollars, depending on how many nights you book. You can use your credit to pay for rounds of golf, spa experiences and all sorts of other stuff on the resort. There’s no need to reserve anything in advance, just visit the Palace Vacation Planner desk when you arrive to plan your activity or get ideas. The Grand At Moon Palace is an ideal Cancun lodging choice for your trip to Mexico. With numerous amenities for guests such as room service, car rental, children's play area, you will wake up at The Grand At Moon Palace feeling invigorated every day for your time in Cancun. 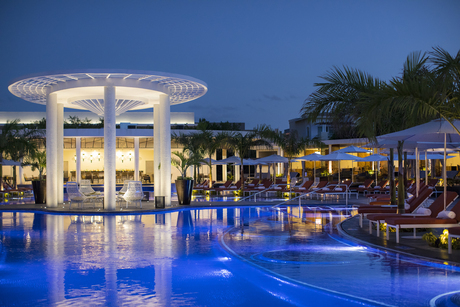 Don’t let this amazing reservation opportunity pass you by, book your stay at The Grand At Moon Palace today to make the most of your time in Cancun, Mexico.